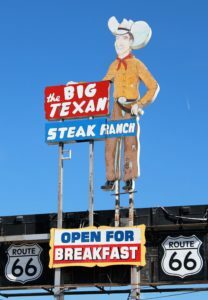 Big Texan Steak Ranch, Amarillo, Texas. 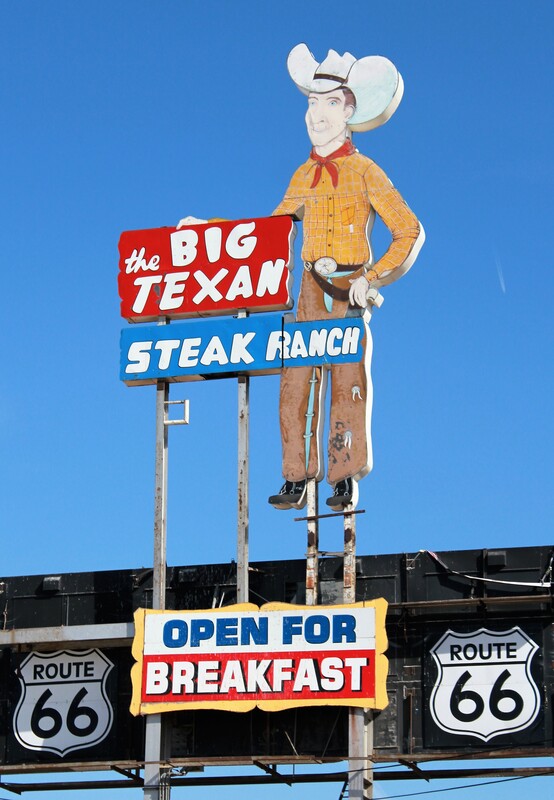 Home of the 72-ounce steak. If you can eat it in an hour your meal is free. But you must also finish the salad, shrimp cocktail, roll with butter and baked potato. Otherwise, you pay $72. The record holder is a 125-pound woman named Molly who in 2014 finished the meal in just 4 minutes 58 seconds. In the same hour she ate another entire meal—two meals in 14 minutes and 57 seconds. In 2015 she returned to beat her one-meal record by 40 seconds. A Siberian tiger ate the meal in 90 seconds in 1999, and a lioness beat that time by ten seconds in 2012. Neither used the Big Texan bathroom, with great seats and free admission.